Let’s take another look at USD/CAD as it has fallen back to parity and possibly a reversal point from the down trend. On the chart, we can see a very basic support play setting up as the pair touches 1.0000, where it has found enough buyers to push it back up in recent past. Stochastics are at oversold levels indicating the move from 1.0250 to 1.0000 may have lost some steam. Oil has now run up to $124/barrel from a recent low around $113/barrel within the last week. That run may be overdone in the short term as a well, so a small pullback may be in the cards for that commodity and the Loonie within the next few trading sessions. 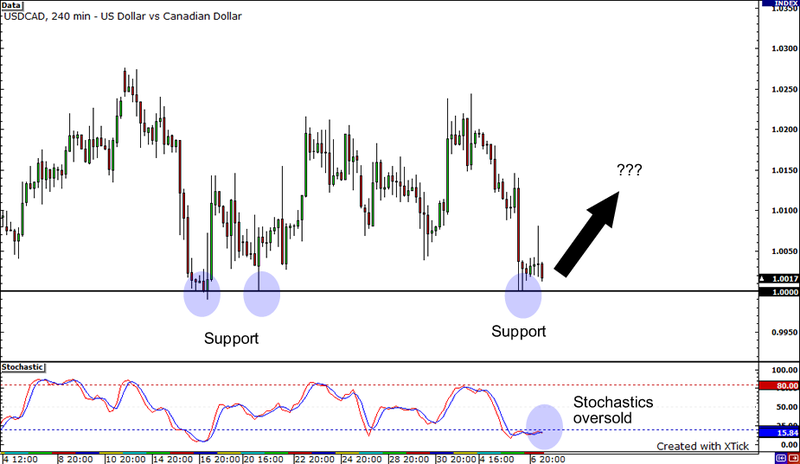 So, we will play the support area on USD/CAD in hopes to catch a correctional rally. Since we are playing against the trend, we will keep the stops tight.